I am not sure if it is the upcoming wedding or that my daughter turned 18 this year, but it seems like just in the last few months, every time I look in the mirror my reflection is changing dramatically. The signs of time passing are becoming more and more apparent, and I know it is time to really get serious about slowing down the signs of aging. 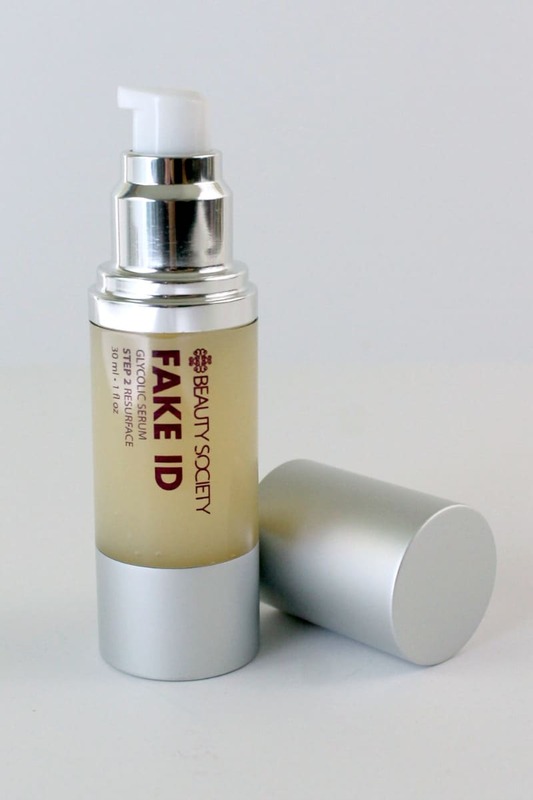 When Independent Beauty Society Consultant Danielle Fraher said she was sending in Fake ID – a new glycolic serum that helps to resurface your skin and fight the signs of aging, I was excited to try it out. Beauty Society has been offering high-quality skin care products since 2004. They are “A Company with a Conscience” that focuses on superior products at a price everyone can afford. From the product ingredients to the biodegradable packing supplies – Beauty Society focuses on being eco-friendly in every aspect. They even plant a tree with every refill purchased to help combat deforestation in Madagascar, Haiti, and Nepal. Holding to the creed of consciousness our line is paraben free, sulfate free, cruelty-free, gluten-free, vegan-friendly and made in the USA. The Fake ID Glycolic Rejuvenating Serum is a powerful blend of glycolic and lactic acids shown to reveal results in as little as three days! It is a time release serum that works to reverse the signs of sun-damage, fine lines, enlarged pores, hyperpigmentation, and wrinkles. With just a little dab morning and night you will immediately feel and see the difference. Fake ID is formulated with SeaWhip which calms any irritation, inflammation or peeling that often accompanies strong AHA products. FakeID is also part of the Treasure not Trash program, so you can order refills of the product to help cut down on waste. Save your skin, save money, and save the planet – all in one. It does not get any better!